I never shopped at Trader Joe’s until moving to San Diego. I had only been in one, one other time. It can be overwhelming to say the least. I would only browse the outer walls, sticking with my favorites – their produce, meats, & diary items. Boy, was a missing a world of yummy goodness! Their frozen section has some awesome foods and their chips are the best! Oh, their oatmeal and juices are great too! So, I love Trader Joe’s, yes. I love Trader Joe’s so much, that a lot of our diners are all TJ products. 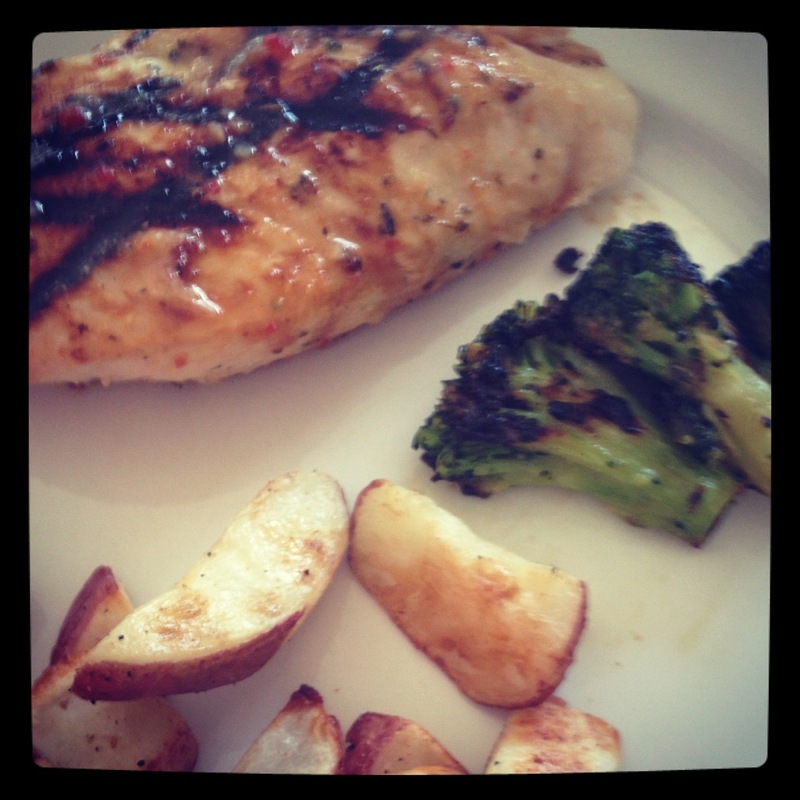 Tonight we had grilled chicken, roasted potatoes and broccoli. I roasted the potatoes and broccoli in the oven. Lay tin foil down, spray with canola/olive oil. Toss broccoli with EVOO, salt, & garlic. Lay on baking sheet. Set oven to 400* and bake for 25 minutes. The potatoes, I cooked as stated. Once you pull the broccoli out, squirt with a little lemon or lime juice. Another yummy Trader Joe’s dinner. 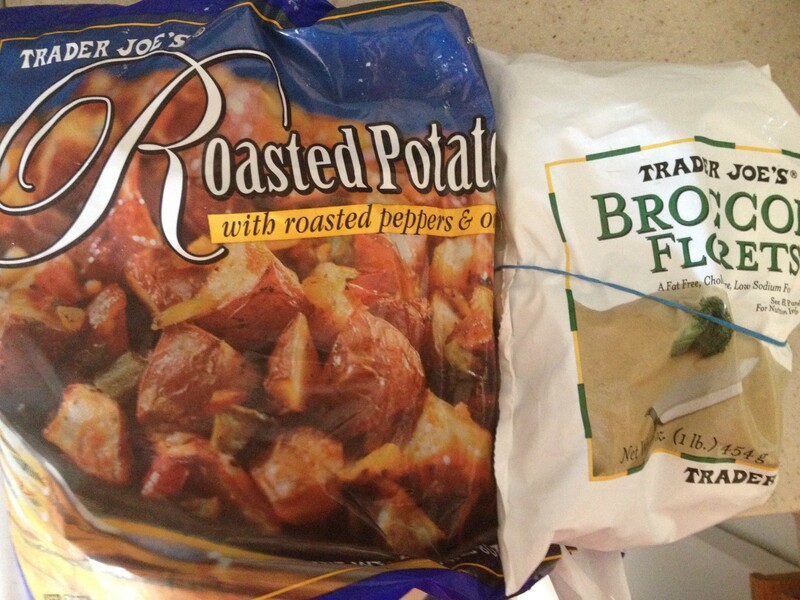 Using Trader Joe’s ingredients…so (mostly) organic and 100% healthy! 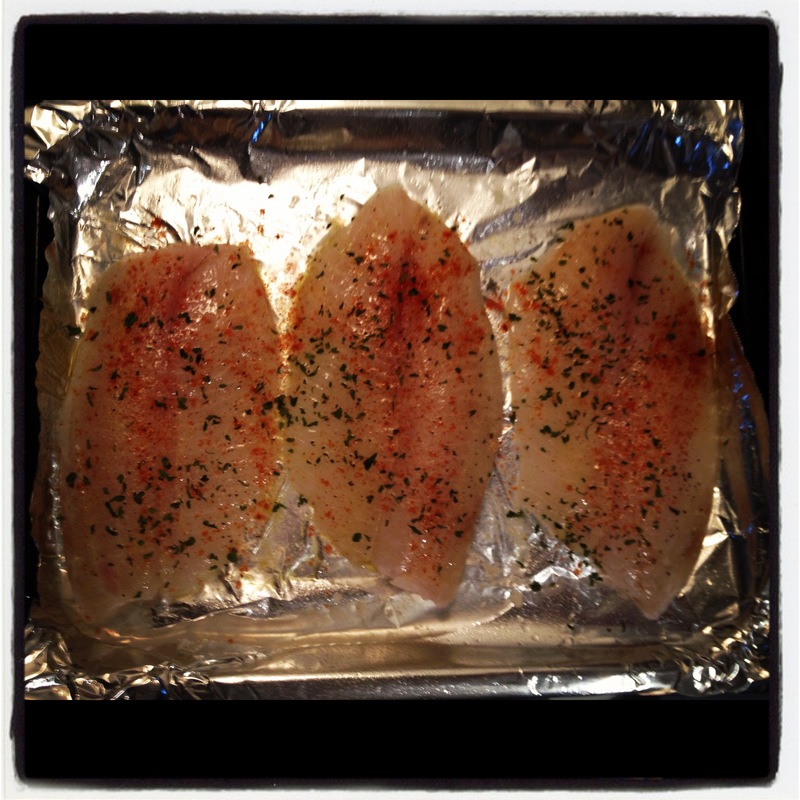 EVOO, parsley, lemon, paprika, Adobo seasoning (red cap), s & p, tilapia filets. Line baking sheet with foil and lightly coat with organic canola oil spray. 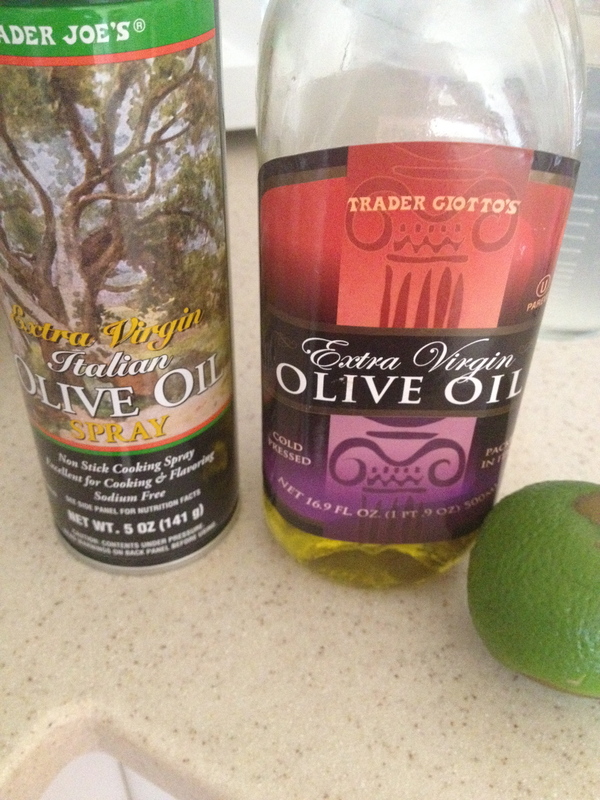 Use brush and coat each filet with EVOO. Cut lemon in to wedges, sprinkle juice from one wedge per filet. Then sprinkle with s & p, Adobo seasoning (optional), paprika, & parsley flakes. Bake at 350* for 15 minutes. Serve with brown/white rice and your choice of veggie. Our choice you ask? 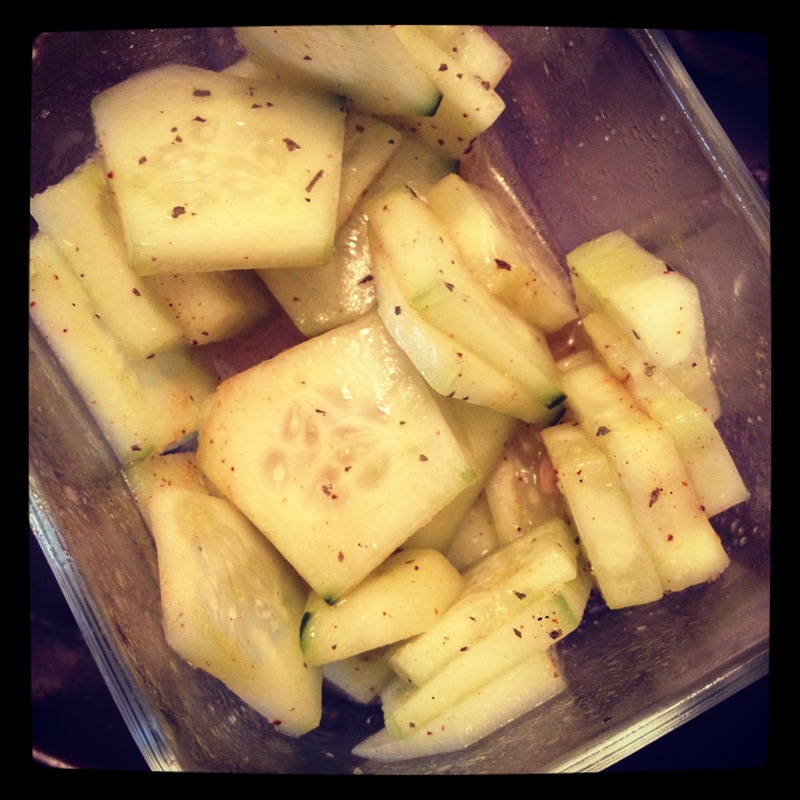 Cucumbers marinated in EVOO, lemon juice, salt/pepper, basil, & chili powder. 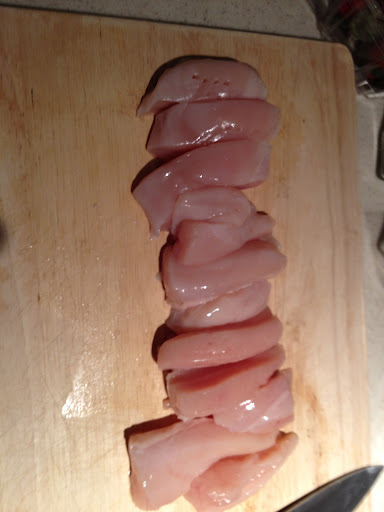 Slice chicken breasts in to 1 inch strips. Boil noodles according to package, I used half a box for 3 people. 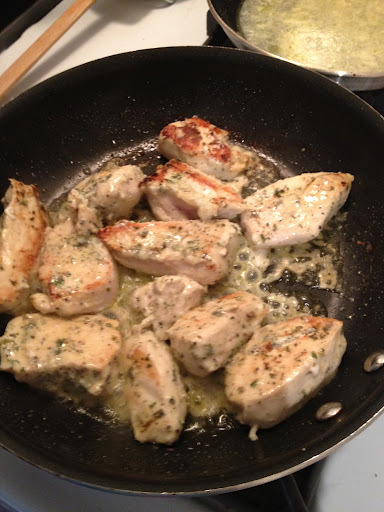 Pour chicken and marinade in to skillet, cook chicken fully. Heat olive oil, garlic powder, & pesto in separate skillet. Once heated through, add to chicken. Bring to a boil (only a few minutes). Then add noodles. I posted the recipe as I found it. 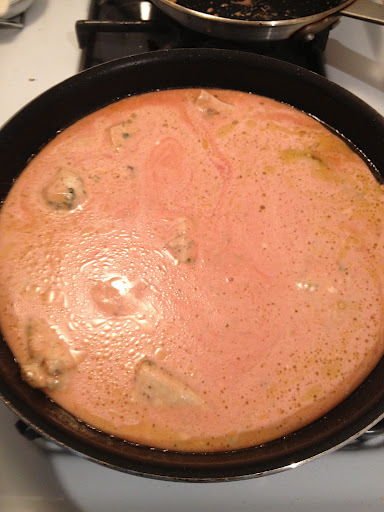 I added 2 tbsp of flour once I added sauce to chicken (before noodles) to help thicken it up. The original recipe calls for 1 c. tomato sauce and only 2 spoonfuls (tbsp) of pesto, next time I will cut the tomato sauce to 1/2 c. and definitely up the pesto. 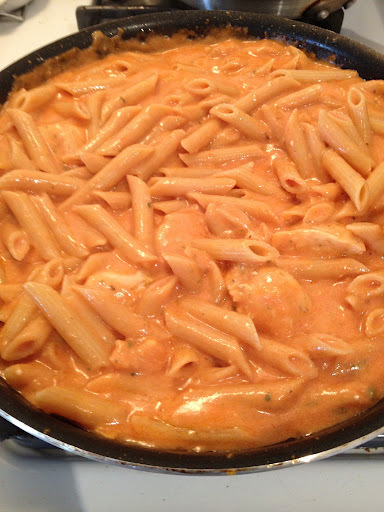 The tomato sauce is strong and takes away from the taste. 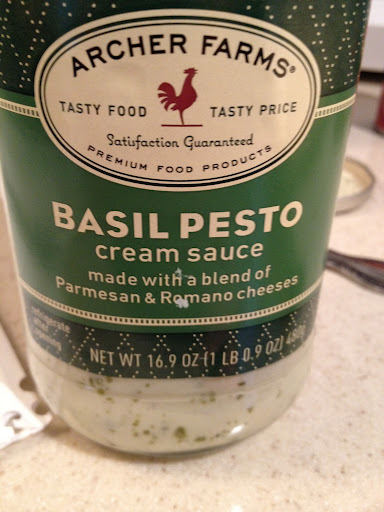 I also added a few shakes of basil, sage, and parsley once it was all mixed together. Over all, very easy and tasty. 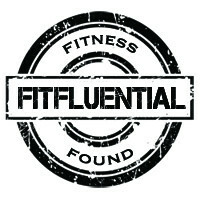 But will definitely make those adjustments next time I make it. I just used Archer Farms (Target) sauce. Since I’m carbo-loading this week for my half-marathon this weekend, I also added some whole wheat sourdough bread. Hubby and daughter approved, so I’ll be making again! Enjoy! 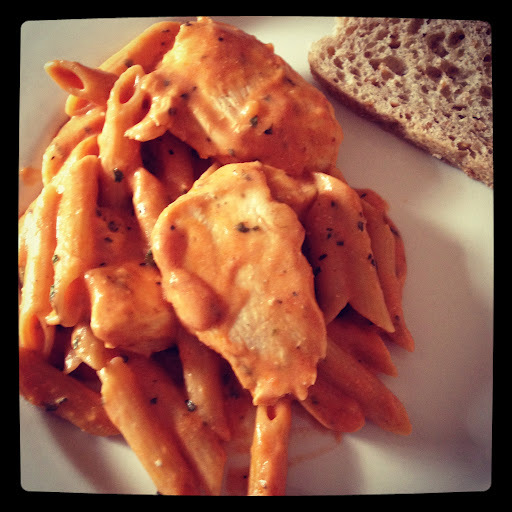 Need something super easy for dinner? I gotcha covered! Avocados, pitted, cut in to chunks. 1 1/2 cups of shredded cheese (your choice) I used Mexican blend. Line baking sheet with al. 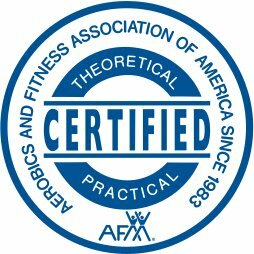 foil. Mist both sides of tortilla with cooking spray and place on sheet. Bake until crisp, about 5 minutes. Or a little longer if your oven isn’t a fast cooker. 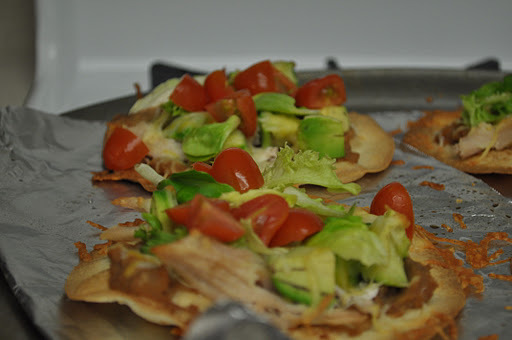 Spread refried beans on tortilla, top with chicken and avocado. Return to oven for another 4-5 minutes until warmed through. 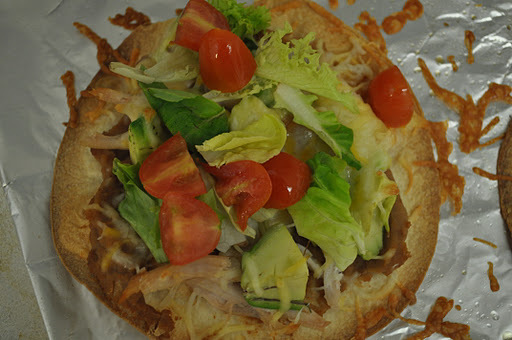 Top with lettuce and tomatoes/salsa. I’m totally guessing, but probably between 300-400 calories depending on size and ingredients used. 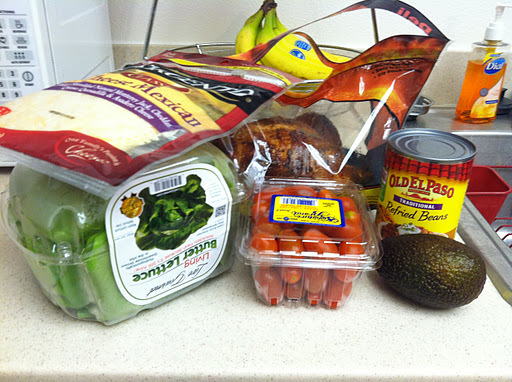 Also, if you want a more “healthy” version like me…you can use whole wheat tortillas and organic produce and cheese. I have to admit, some of my ingredients tonight are not organic, but I’m running super low on everything. Trader Joe’s here I come! You can also substitute ingredients or add them. Anything from sour cream to jalapenos. 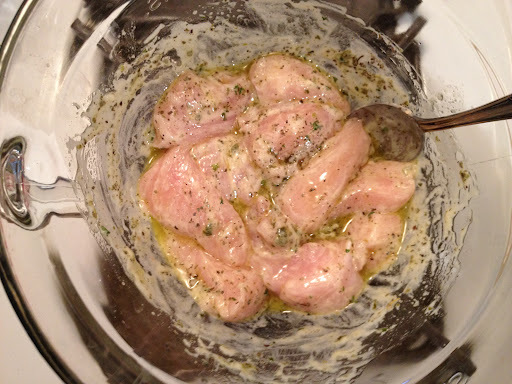 Mix salad dressing and water, pour over chicken breasts in crockpot. Cook on low for 3 hours. 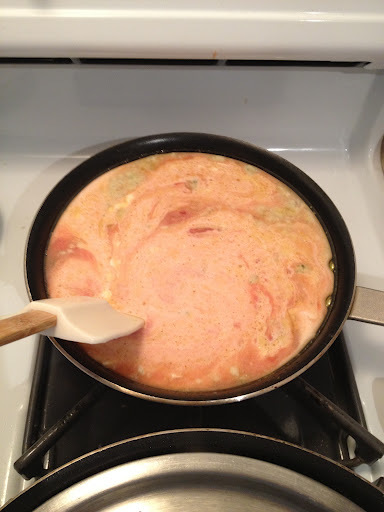 Mix cream cheese (soften in micro for a few seconds) and cream of chicken until blended. Pour over chicken after 3 hours. It should start to have a gravy consistency. Cook chicken 2-3 more hours on low. Service over rice or noodles. 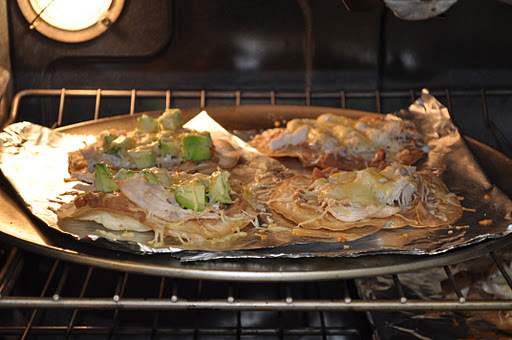 This recipe is super easy and heats up well.